Vf Wheely Cute, under jockey G.R. 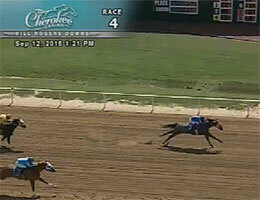 Carter, Jr., sets the third fastest time in Saturday's Black Gold Futurity Championship(RG3) trials. CLAREMORE, OK�SEPTEMBER 12, 2015�Vf Wheely Cute broke her maiden in impressive fashion on Saturday as she posted the third fastest time during 11 trials contested for the Black Gold 350 Futurity Championship(RG3) Saturday at Will Rogers Downs. The 10 fastest qualifiers, from the 94 two-year-olds who participated in Saturday's trail races, will return to the Northeastern Oklahoma raceway on Saturday, September 26 to vie for the winner's share of a $310,000 purse. Trainer Brian Muse saddled the homebred, Vf Wheely Cute for owner/breeder Victory Farms. The IVORY JAMES filly won the fourth trial with authority, posting a :17.630 time following a 2�-length victory. It was the first win in five career starts for the gray filly out of Wheely Quick, by The Harder They Fall. Champion jockey G.R. Carter, Jr. was up. For the complete list of Black Gold 350 Championship Futurity(RG3) qualifiers, their times, sires, dams, owners, breeders, trainers and jockeys CLICK HERE.